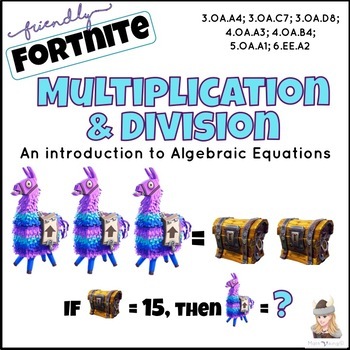 Introduction to Algebraic Equations: Multiplication, Division FORTNITE FUN! Fortnite Fun with Multiplication & Division ideas! 3 llamas = 2 treasures. If one treasure has a value of 6, what is each llama worth? That makes this an FORTASTIC way to introduce common factors! This started out as an enrichment project for third graders who got bored of multiplication LONG before most of the class finished skip counting by threes! Not only was it LOVED by third graders, it supports fourth grade multiplication & factoring and fifth and sixth grade algebraic equations! I made a quick KAHOOT for a fun intro & an extension project. 1 Blank set of cards for students to determine their own values. These cards offer SO MANY OPTIONS! p. 8-12 Set B “Numberless” Students add their own values! 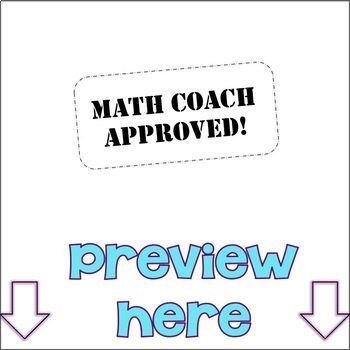 Print as a packet for each student OR use at a center in page protectors (or cut and laminated) to write on and wipe off. p. 25 Student Instructions for an independent “Create your own Algebraic Expressions Google Slides” project. Thank you for EXPLORING MATH with me!! If you like this resource PLEASE Review and Pin it! Remember, TPT rewards us for reviewing!! Grade 3-6 Word Problem Generator: Create Your Own!